Project 1808 executive director, Dr. Linda Vakunta (3rd from right), Project 1808 country director, Mr. Ishmail Barrie (1st from right), with program staff and instructors. 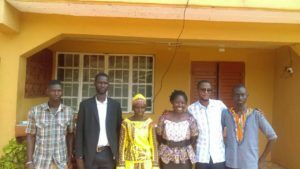 Program launch, Country coordinator, Mr. Ishmail Barrie; Project coordinator, Mr. Abdurrahman Bangura and 1st cohort of Ebola Survivors. The program launched with 30 survivors spread across the 4 training areas. Project 1808 plans to train at least 70 Ebola survivors by the end of the one-year grant. In attendance at the launch was the Sierra Leone’s Association of Ebola Survivors’ public relations officer, Daddy Hassan Kamara. Thanking Project 1808 and it’s country coordinator Mr. Ishmail Barrie, Mr. Hassan Kamara noted his awe at Project 1808’s boldness and forward thinking to implement such a program for survivors, the first of it’s kind. Project 1808 Executive Director, Dr. Linda Vakunta is already thinking of sustainability and looking to the future. 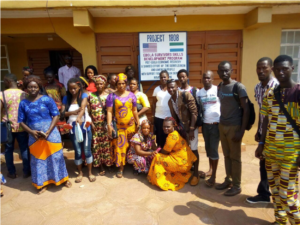 “We would love to continue to offer these training courses free of charge to Ebola survivors but to do that we need more funding. So I am actively seeking funding sources and partners who share our vision to empower Ebola survivors with skills to support themselves.